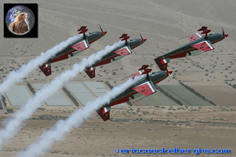 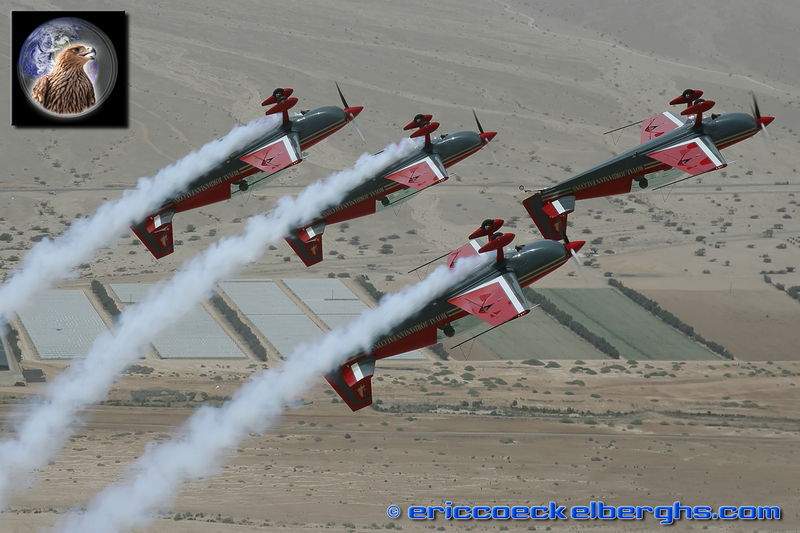 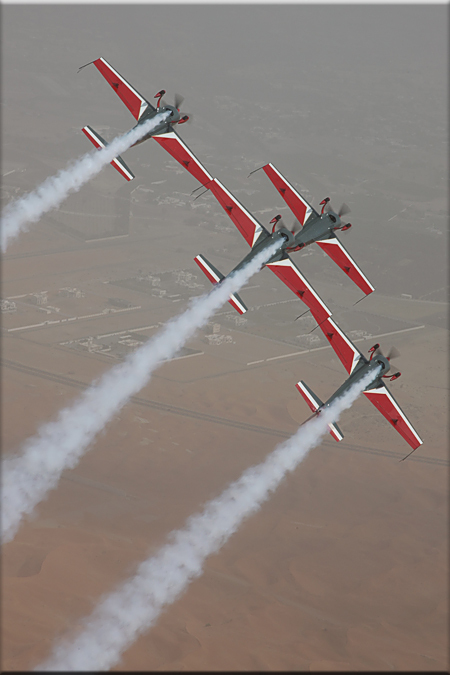 By the initiative of the late King Hussein Bin Talal, the Royal Jordanian Falcons were formed in 1976 as Jordan's national aerobatic team. 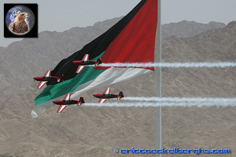 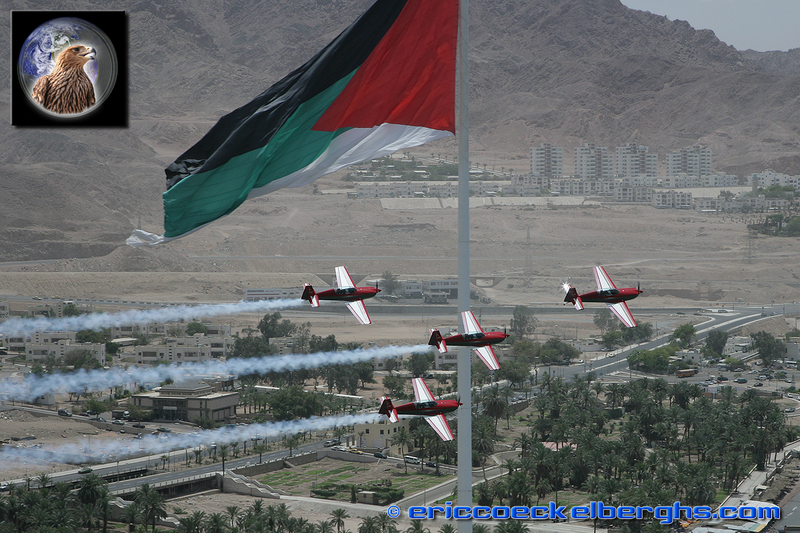 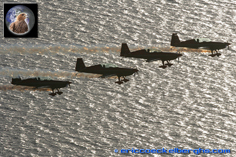 Not only did they build a very strong reputation for precision, professionalism and a spectacular performance, they also became the ambassadors of Jordan at many international airshows. 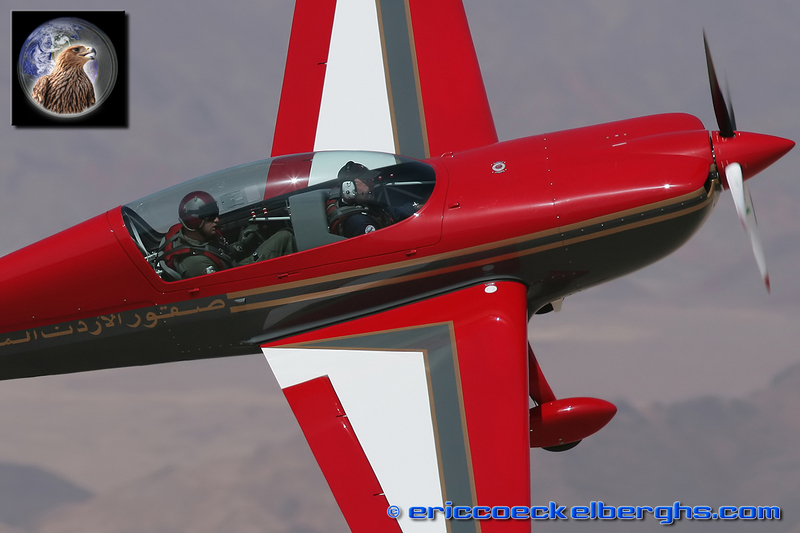 Every year the team has a European tour to present the high level of aviation skills in Jordan, and the Royal Jordanian Falcons also hold the primary task to promote the goodwill and interest in their native country. The team headquaters have recently been transferred to the King Hussein International Airport, located in Aqaba near the Red Sea, in an effort to enhance further tourism and investment in the region. 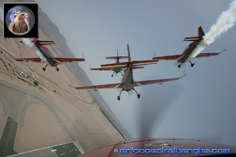 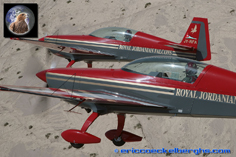 In the early years the Royal Jordanian Falcons flew with three Pitts Special aircraft, later they changed to the Extra 300. 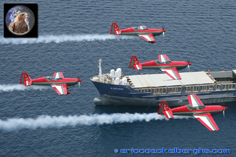 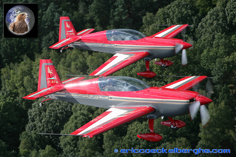 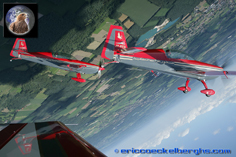 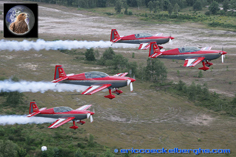 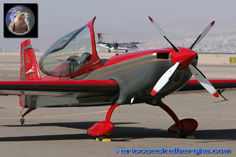 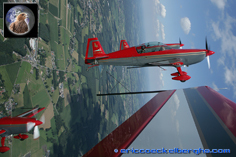 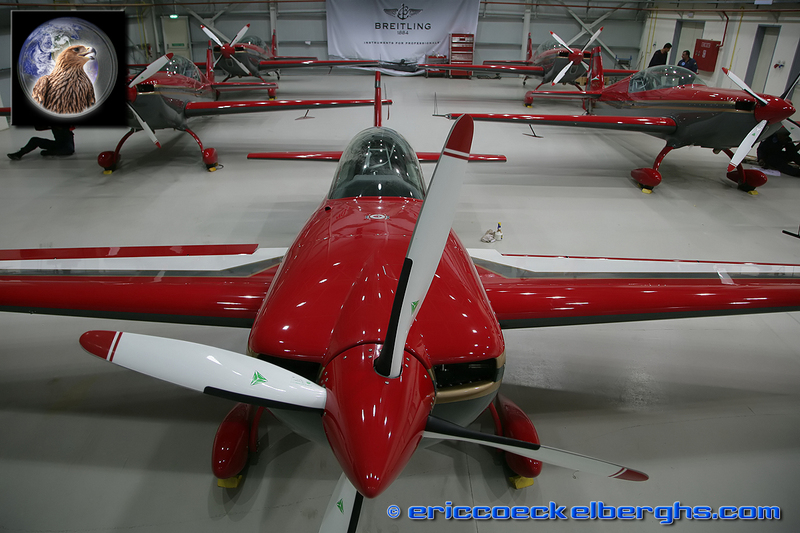 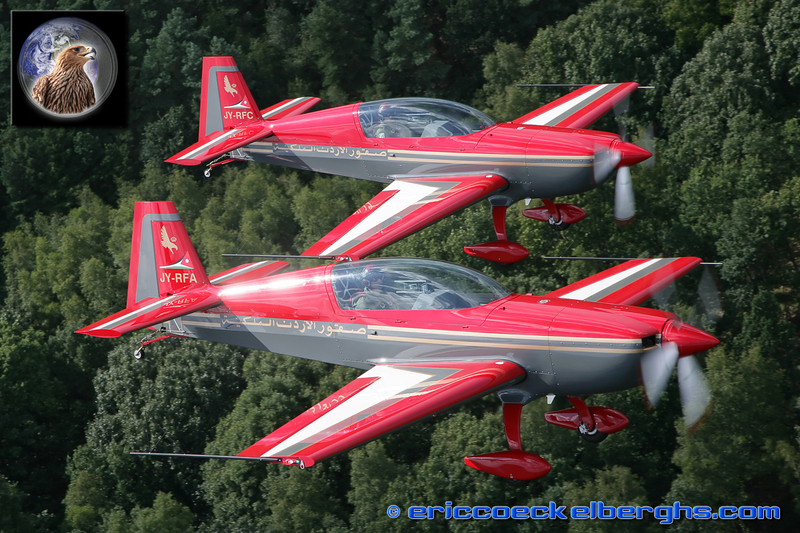 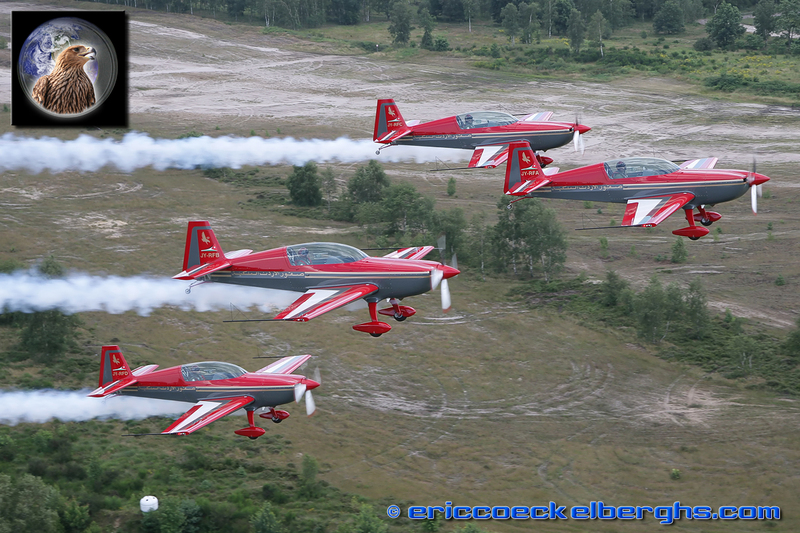 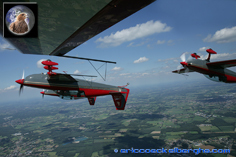 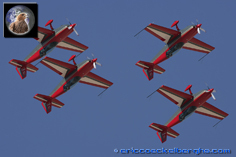 By the beginning of the 2007 season the team took delivery of their latest mount, an upgraded and advanced version of the Extra aerobatic aircraft, the Extra 300L with a lower wing. 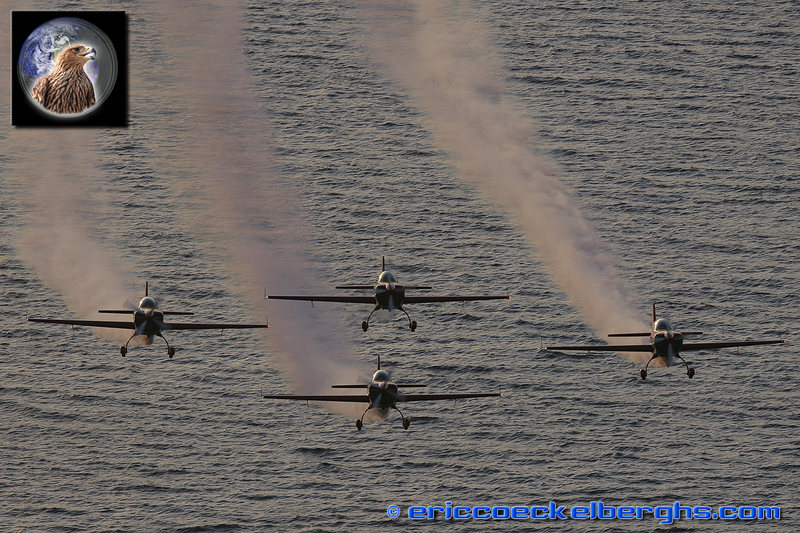 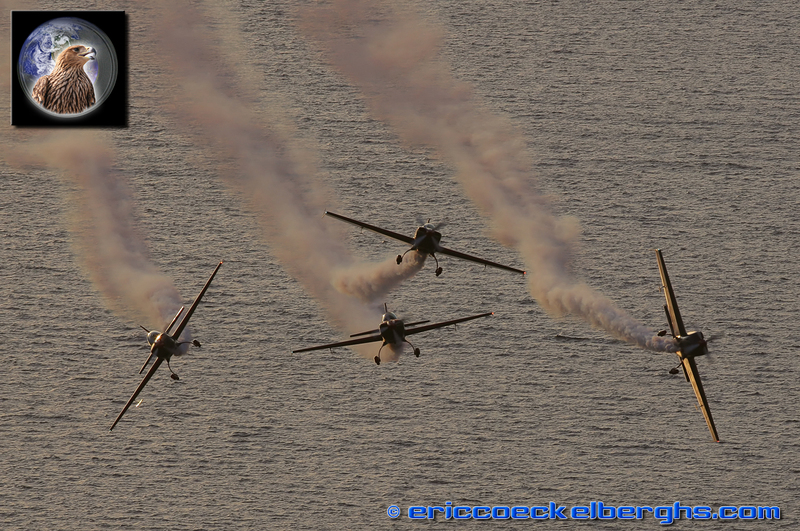 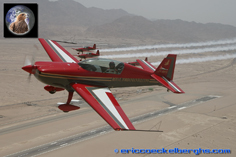 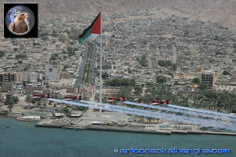 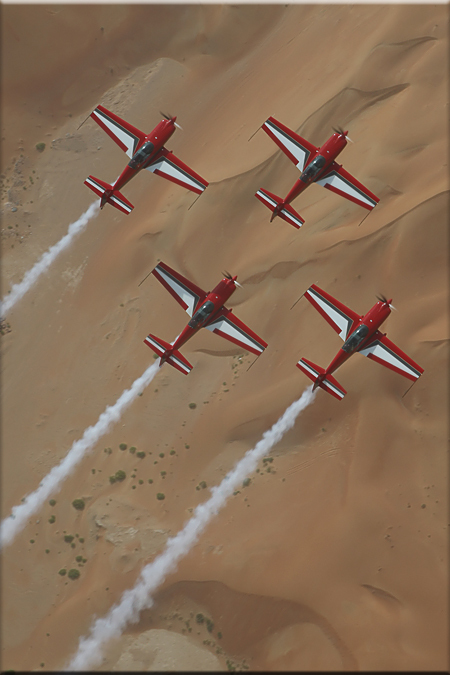 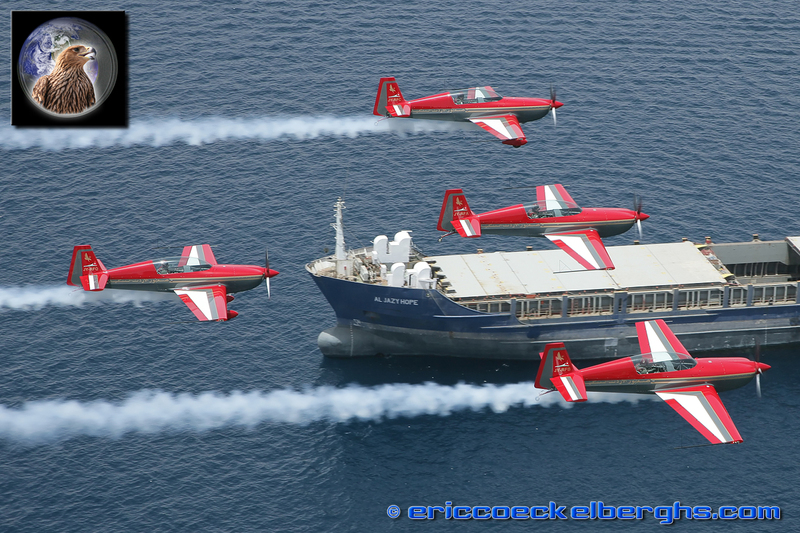 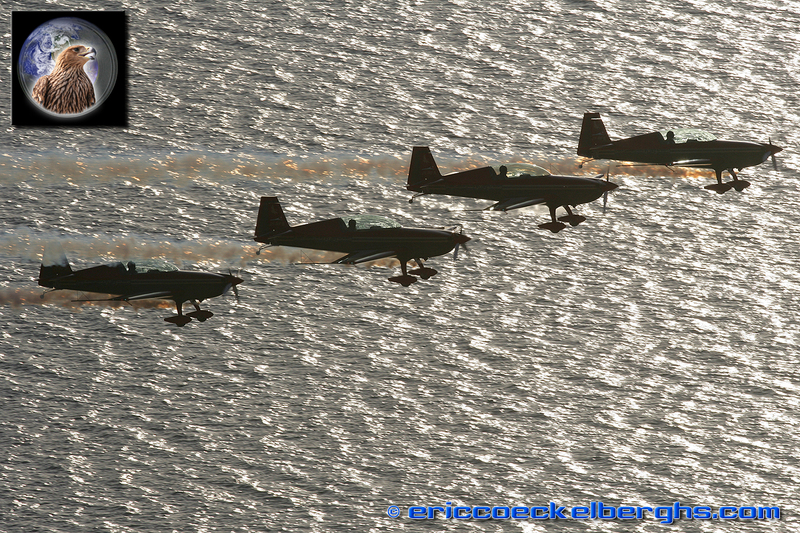 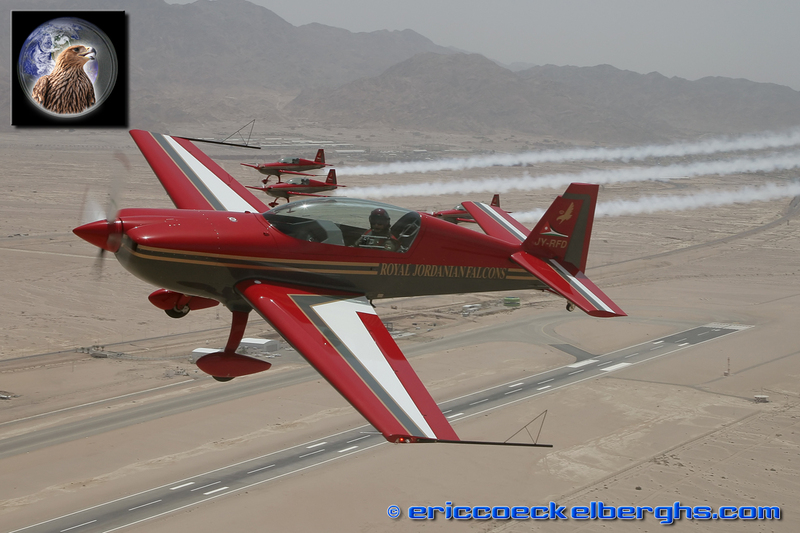 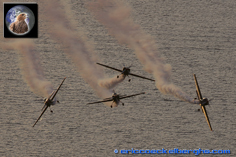 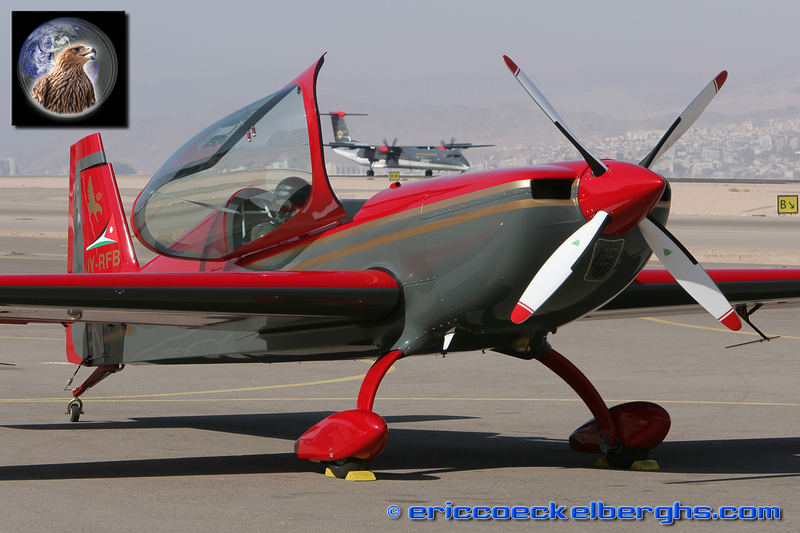 The team has five of these aircraft in Aqaba, the airshow performances are flown with 4. 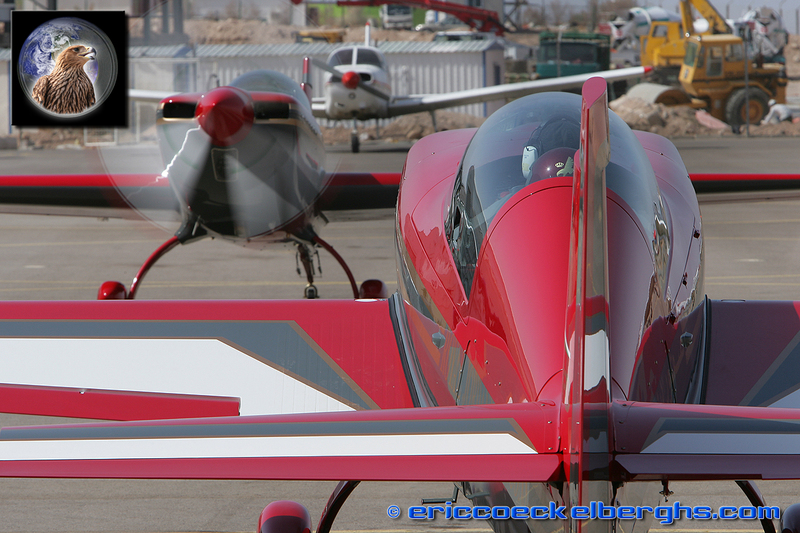 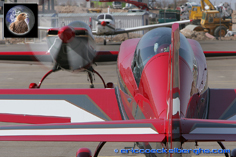 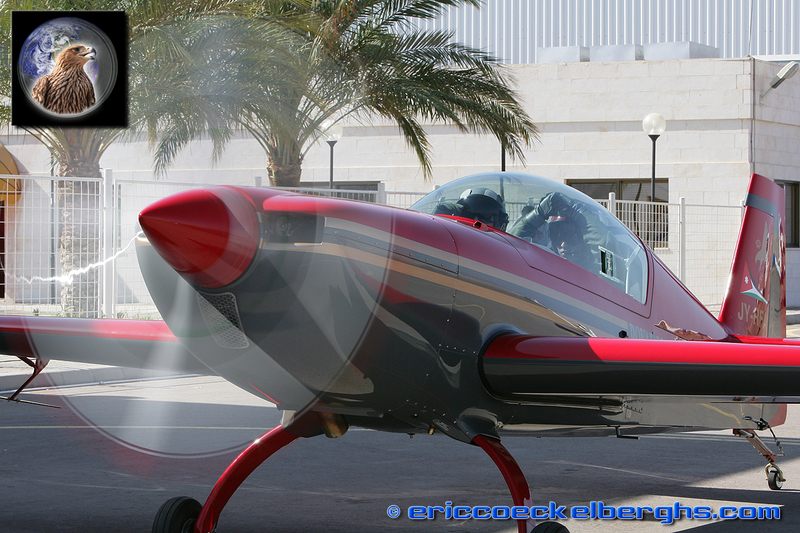 The Extra 300 L is especially build for aerobatics with a positive and negative G-limit of 10! 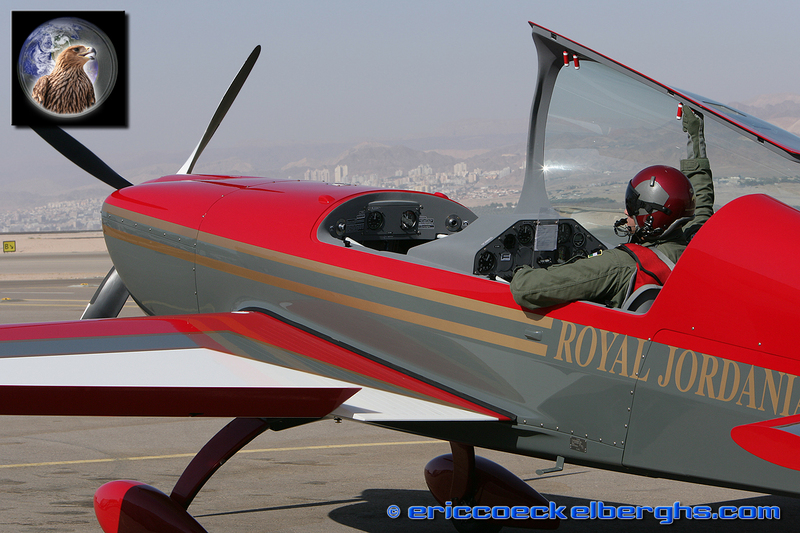 The aircraft is a twinseater with the pilot in command in the backseat. 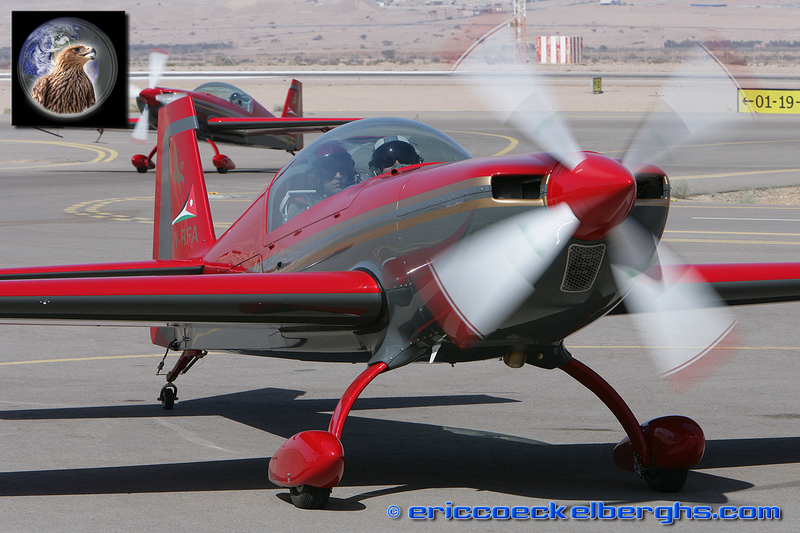 At the King Hussein International Airport, The Royal Jordanian Falcons have all the modern facilities of a topteam. 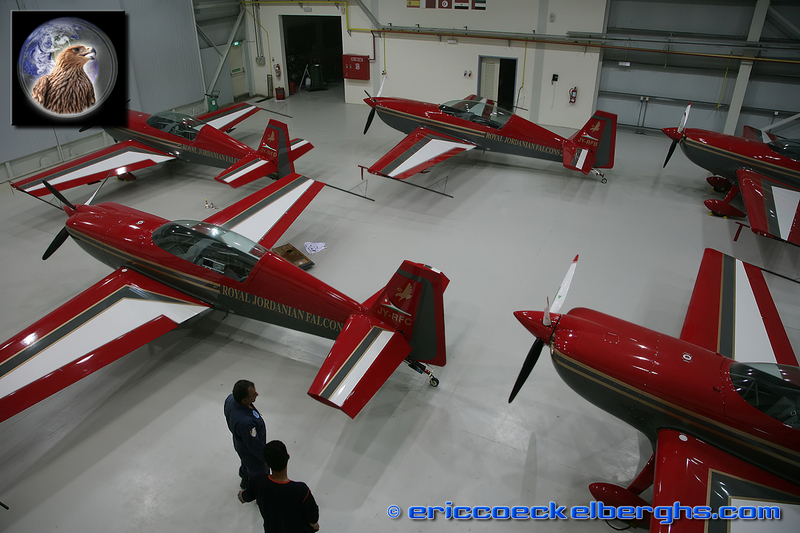 They have their own hangar which is so clean that it could be of a Formula 1 team.........The flags of all the nations they have visited are on the wall, and it is certainly a rare view as you can see all 5 aircraft together. For the European tour, only 4 are desassembled and flown over in two C-130 flights. 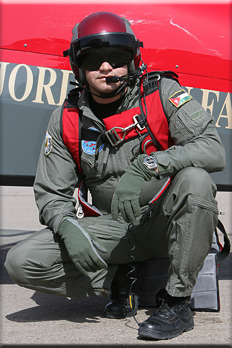 Major Mohammed Qoul is the teamleader for the 2008 and 2009 season. 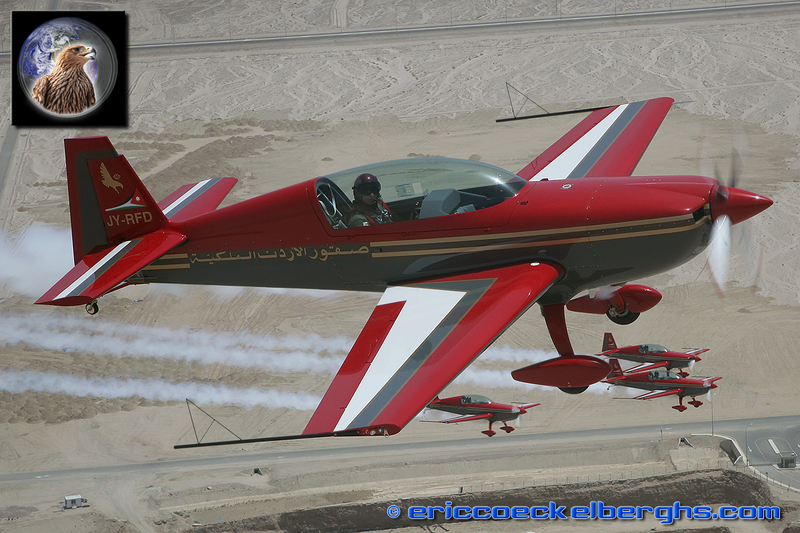 He already joined the Royal Jordanian Falcons in 2003 and has now over 1900 flight hours. 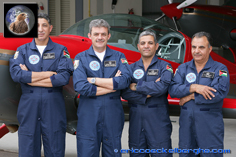 Captain Abdel Hameed Macknay is the teams most recent addition. 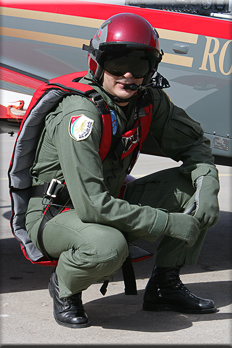 He came also from the Airforce with 1400 hours of flight time. 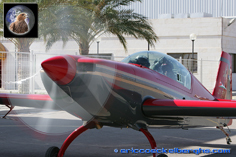 In 2007 he trained with the team to gain valuable experience and for this season he will fly in the left wing position. 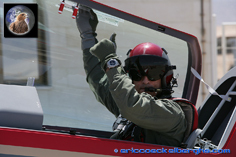 Captain Ahmad Al-Hiari joined the team in 2005 and is flying in the right wing position. 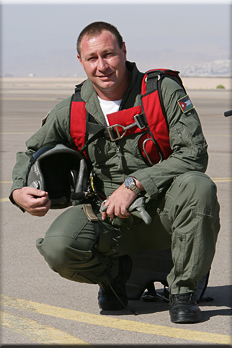 As a fighter pilot in the Airforce he has more than 1000 hours of flight. 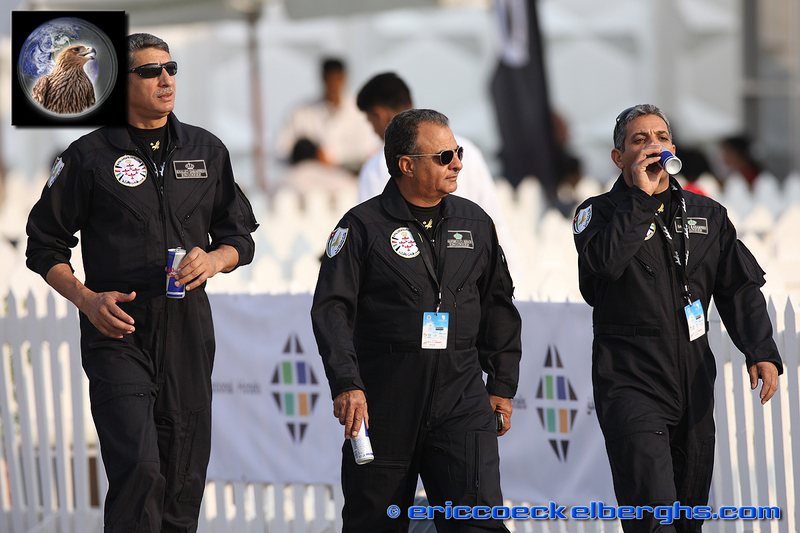 Captain Faisal Nusairat is the slot pilot, flying the number 4 position. 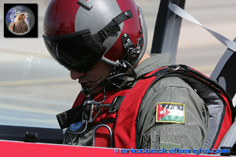 He graduated in 1998 as a fighter pilot and has now over 1200 hours flighttime. Faisal will also fly the solo aerobatic manoeuvres. 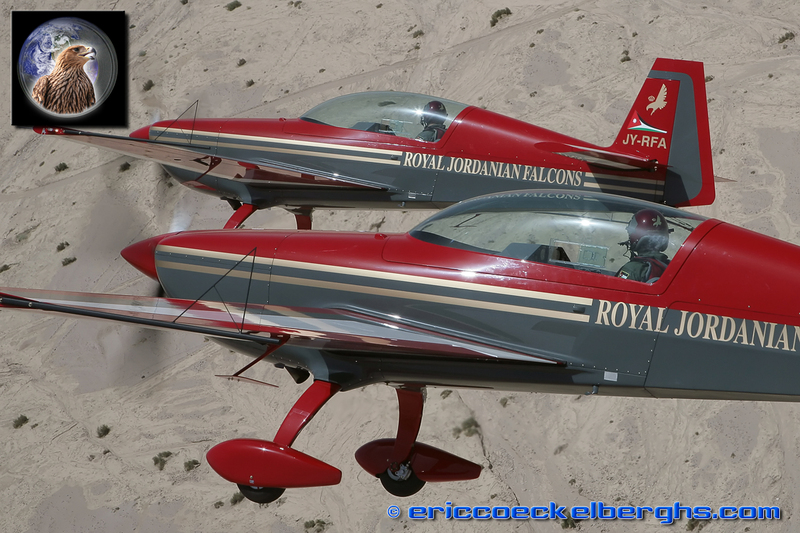 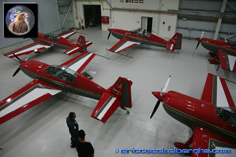 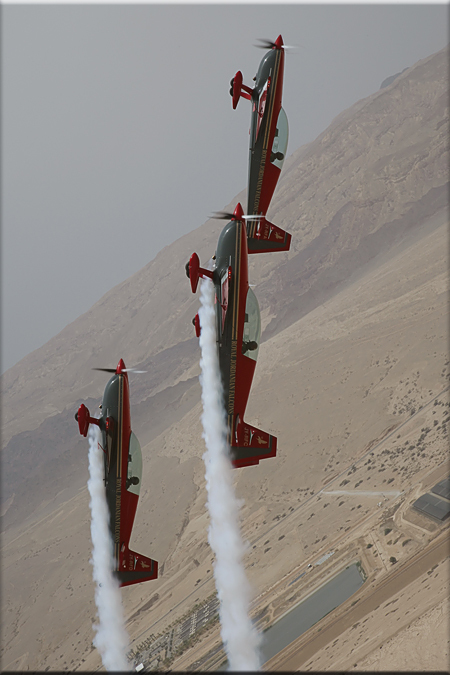 The Royal Jordanian Falcons only have a small, but very dedicated team of mecanics. 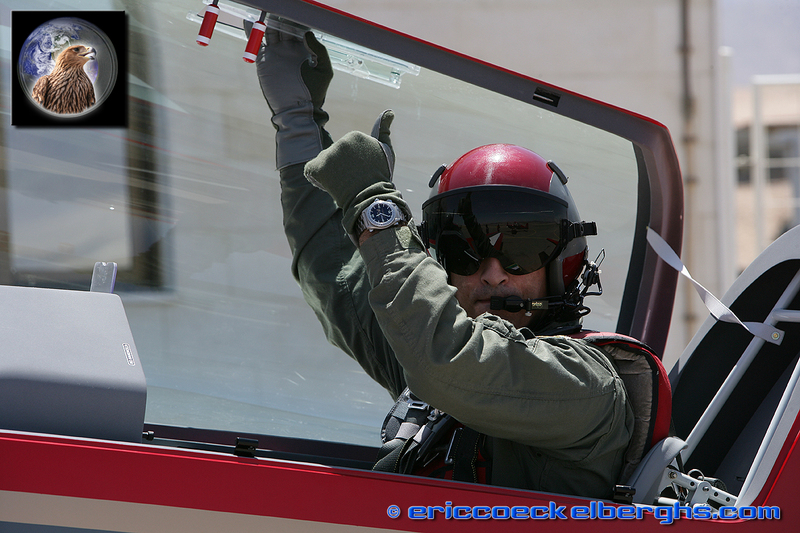 Engineer Riyad Ayyoub is Director of engineering and maintenance, he joined the team already in 1985! He holds the inspection authorization from the Jordanian Civil Aviation Authority. 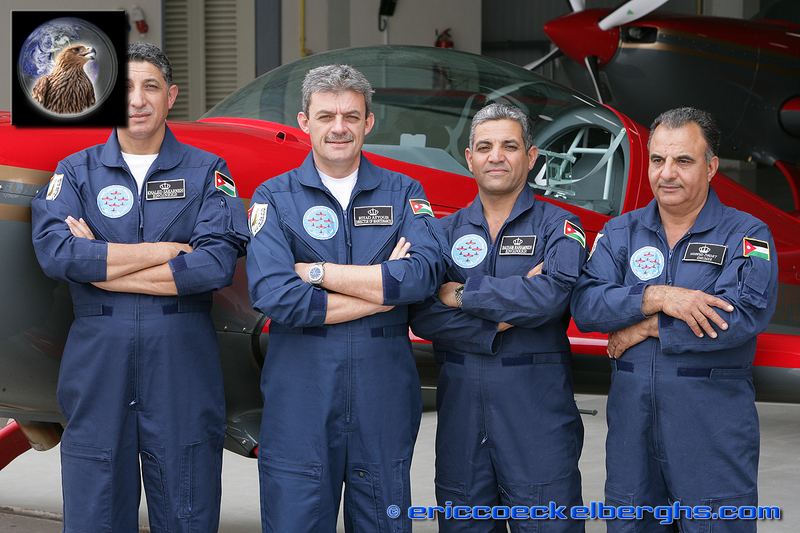 Engineer Mahmoud Abadi joined the team in 2004; he came from the Airforce were he worked on aircraft as the Dakota, C119, Dove, C-130 and the Casa 212. 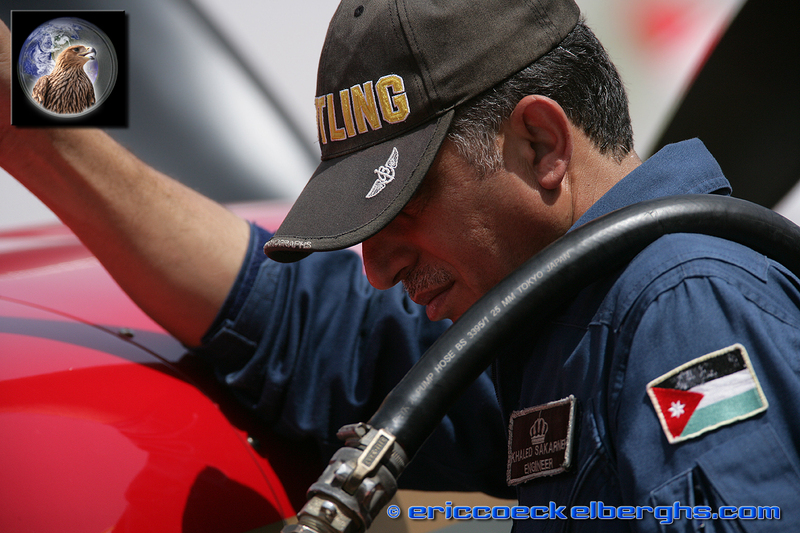 Engineer Bassam Rahamneh came to the team in 2000. In the Airforce he worked on the fighterjets as the F-5 and Mirage F-1, and also on the C-130 and PC-7. 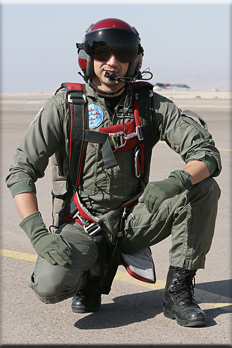 Engineer Khaled Sakarneh worked in the Airforce on aircraft as C-130, casa 212 and Sabre Liner. 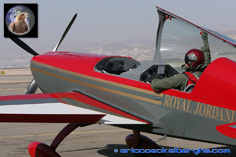 In 1994 he joined the Royal Jordanian Falcons. The practice flights start from early in the morning when the sun is not yet too hot. 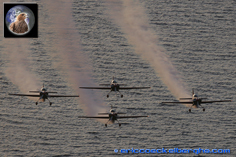 As flying in a tight formation with the Extra 300 is far more demanding then flying jet aircraft in formation, the schedule can be very loaded with up to five display rehursals a day! 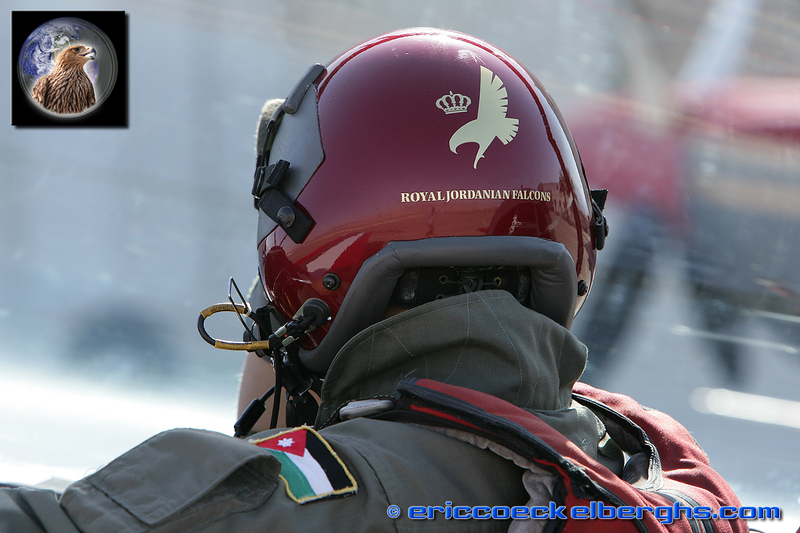 The advantages of a beautifull location as Aqaba is a steel blue sky, always nice for pictures. 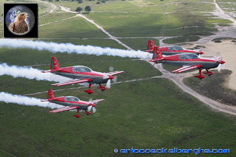 However during the springtime it is also the period of the migration of the birds, so sometimes the trainings are cancelled....in just a few minutes time, the sky can be filled with a whole wave of birds of prey. 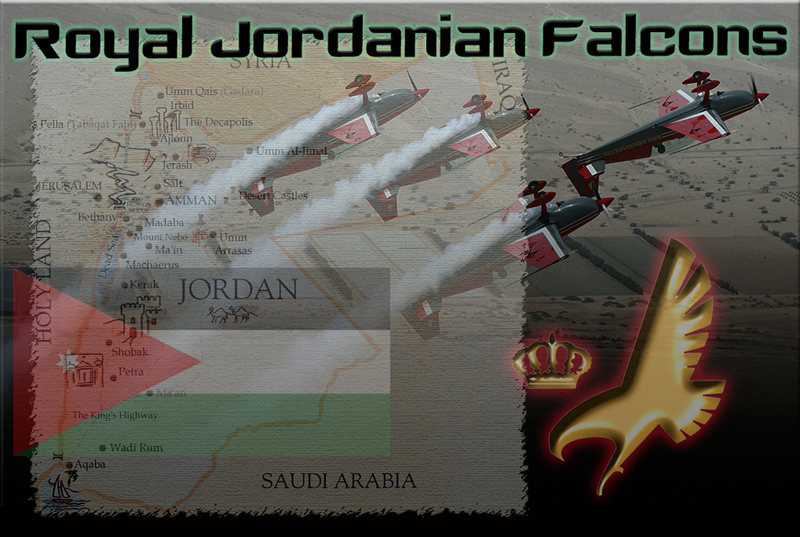 Jordan is a beautifull country to visit with some of the worlds new wonders. 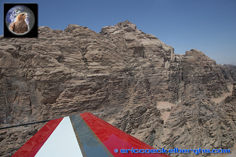 The Wadi Rum desert is absolutely stunning, and the Red Sea is so clear you can explore all the wildlife by just diving into the water.